Each bagel is filled with blueberries. Kosher, Fat Free and Cholesterol Free. Made with cinnamon and filled with raisins. Kosher, Fat Free and Cholesterol Free. Everything including: Sesame seeds, Poppy seeds, Minced onion and Minced Garlic. Kosher, Fat Free and Cholesterol Free. Offering the sweet taste of french toast with maple syrup. Kosher, Fat Free and Cholesterol Free. 72 per case, 2 oz. Featuring rolled oats, corn meal, cracked wheat, whole wheat flour, sunflour and sesame seeds. Kosher, Fat Free and Cholesterol Free. With minced onion. Kosher, Fat Free and Cholesterol Free. Straight from the Bronx and kettle boiled with New York spring water. Made with enriched bromated flour bleached. Kosher, Fat Free and Cholesterol Free. Covered with poppyseeds. Kosher, Fat Free and Cholesterol Free. Classic pumpernickel with caraway seeds. Kosher, Fat Free and Cholesterol Free. 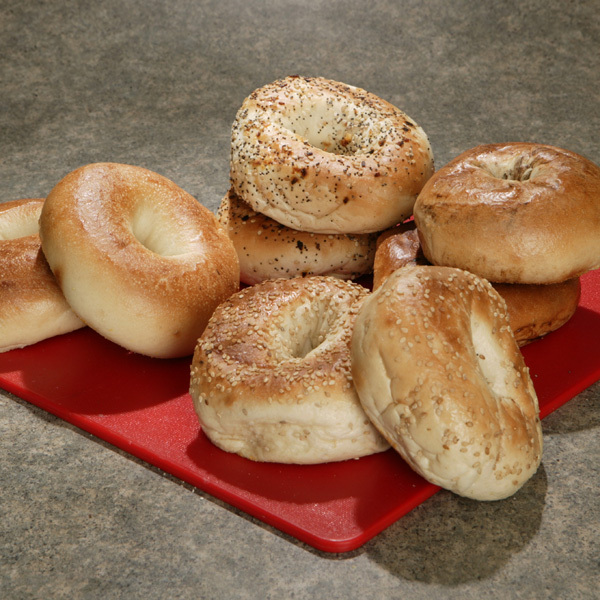 Just Bagels are the freshest, tastiest and healthiest of bagels containing no oils, fats, cholesterol, or preservatives. Made in New York City from scratch and kettle boiled. Sundried tomatoes throughout. Kosher, Fat Free and Cholesterol Free. 48 per case, 4 oz. 12 Plain, 12 Cinnamon Raisin, 12 Sesame and 12 Everything Bagels. Kosher, Fat Free and Cholesterol Free. Contains 12 each, Asiago, Blueberry, Multigrain and Plain. Kosher, Fat Free and Cholesterol Free. Whole wheat flour. Kosher, Fat Free and Cholesterol Free.